With its rich, intense perfume and somewhat pungent aroma, cinnamon is the key flavor-giving ingredient in some of the most relishable dishes throughout the world. Despite its now prominent culinary use, in the past cinnamon was highly valued for both its unique aroma and medicinal properties. The spice boasts an impressive aromatic profile with compounds with an outstanding antioxidant value as well as antibacterial, antifungal and anti-inflammatory effects. Cinnamom makes a potent natural antioxidant, antiseptic and anti-inflammatory. Its action is said to protect against oxidative stress and prevent cell damage and chronic disease. Drinking cinnamon tea, a remnant of the old traditional medicine practices, is said to help treat bloating and flatulence, relieve abdominal discomfort associated with bloating and soothe the stomach. Also, because cinnamon is rich in minerals, it makes a great tonic and energizing agent, restoring vitality and stimulating immunity. Where does cinnamon come from? 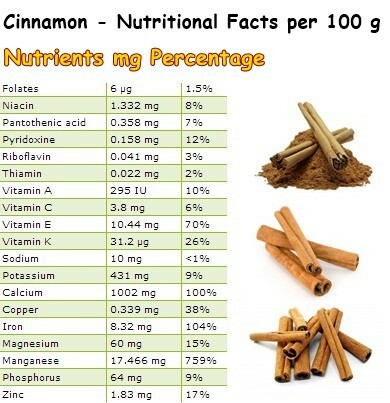 Cinnamon is actually the rolled bark of several Cinnamomum tree varieties. It is commonly sold as cinnamon sticks, ground or powder cinnamon or as cinnamon tea bags. Because it such a popular flavor among both children and adults, it is added to a myriad of goods such as cereals, bread, pies, pastry or drinks and used to spice everything from curry and stews to coffee and milk. However, not all cinnamon is the same. Depending on pungency and quality, there are two main types of spice valued for their particular taste intensity: ceylon cinnamon and cassia. 1) Ceylon cinnamon sticks are thin, light-brown bark strips taken from the heart of the Cinnamomum verum tree, native to Sri Lanka. Ceylon cinnamon has a light flavor and is more friable than other varieties. 2) Cassia cinnamon is the bark of the Cinnamomum cassia, Cinnamomum loureiroi or C. burmannii trees from Bangladesh, China, India, Indonesia, Myanmar and so on. It is much more pungent and much thicker compared to ceylon. Cassia cinnamon sticks are harder and darker in color. As far as quality standards are concerned, ceylon cinnamon is considered to be the real cinnamon spice. Cinnamon is an incredibly healthy spice, provided it is high quality. It is a potent anti-inflammatory, antioxidant, antiseptic and anti-diabetic agent. Moreover, cinnamon is a carminative, meaning it helps expel gas from the stomach, thus relieving bloating. Being a rich source of minerals, cinnamon is also a great tonic because it promotes vigor and energizes the body. Cinnamon oil can be used as a therapeutic massage oil because it gives a pleasant feeling of warmth and relaxation. According to the ORAC measurement unit for oxygen radical absorption capacity, cinnamon is one of the spices with the highest antioxidant activity, meaning it offers superior protection against chronic disease as a result of free radical cell and DNA damage. Cinnamon is a great source of flavonoids and carotenes. Zeaxanthin and lutein, for example, ensure retina health and promote good vision into old age. The unique, sweet flavor of cinnamon is a result of a combination of aromatic essential oils such as eugenol, linalool, ethyl cinnamate, cinnamaldehyde, beta-caryophyllene and methyl chavicol (or estragole). 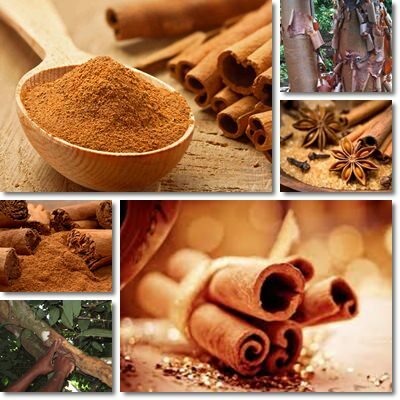 Eugenol gives cinnamon its strong anesthetic and antiseptic properties. Cinnamaldehyde boasts antimicrobial as well as anti-clotting activity, preventing platelet clogging and, consequently, reducing coronary heart disease and stroke risks. Beta-caryophyllene has shown antidepressant and neuro-protective activity. Special compounds in cinnamon stimulate intestinal motility (muscular contractions at the levels of the intestines) and increase the amount of gastrointestinal secretions. This basically means that cinnamon aids digestion and promotes normal, regular bowel movements, helping relieve constipation naturally and improve hemorrhoids symptoms. With an amazing mineral content, cinnamon exhibits great tonic properties as well. As you can see in the nutrition table above, 100 g of the spice contains 100% of the RDI of calcium, 104% iron, 759% manganese, 38% copper, 17% zinc. Calcium ensures strong bones and teeth. Copper prevents gray hair, eye depigmentation and regulates thyroid activity. Iron not only helps in the treatment and management of anemia, but also energizes the body by ensuring our muscles get enough oxygen to support their activity. You can learn more about the benefits and uses of various plants with medicinal properties on the herbs and spices page. Conclusion. Overall, cinnamon makes a great cooking spice and a wonderfully fragrant tea. Consuming it on a regular basis, provided its flavor is to your liking, will supply you with almost all essential nutrients and powerful antioxidants required to keep you in good health. A cup of cinnamon tea after supper is ideal if you want to relax after a hard day. Just make sure you chose quality Cinnamomum verum.